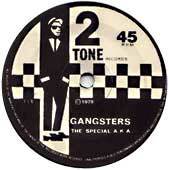 An Eight Part History of The Specials - Part Two - 2 Tone Gangsters. Jerry Dammers had long had a dream of starting his own label, similar to Motown, that they could release their own records on. He composed some artwork, with Horace's help, that was soon to become central to the 2 Tone world, and in fact feature as the label on all their releases. The logo was based on an early album cover picture of Peter Tosh, and with the signature black and white checks dropped in for good measure, Walt Jabsco was born. With a new song written, but no support from the record companies, the Special AKA set about raising some cash from family and friends to record 'Gangsters' themselves. (Read the story behind the song here). They were without a drummer however as Silverton had finally quit, so Jerry turned to his then house mate John 'Brad' Bradbury to fill in just for the recording session. It went so well that Brad was made a permanent member there and then, and the band lineup was completed. Based on the 1964 track 'Al Capone' by Prince Buster. The Special AKA changed the original opening in their version from 'Al Capones Guns Dont Argue' to 'Bernie Rhodes Knows Dont Argue' as a stab at their former manager, and at seedy manager types in general. Short of cash, the band couldn't afford to record a B-side for the single, so a demo recorded two years earlier by Brad, Barry Jones and Neol Davis was dug out, billed as The Selecter by The Selecter, and stuck on the flip side. They called their new label '2 Tone'. Jerry then approached Rough Trade for distribution of the new single, who agreed to press 5000 copies. He then got talking to 'The Damned' manager Rick Rogers, who on hearing the single, and then seeing the bands stunning live performance, leapt on board as manager. 'Gangsters' was picking up airplay and favourable reviews rapidly, and Rick Rogers was working his contacts getting the band shows in London in venues such as the Hope & Anchor. Word of their electric live shows spread like wildfire and they started to build a solid following in the capital city and a buzz amongst the A&R departments too. All this lead to the Moonlight Club in early May 1979, where the Specials played to a packed house of fans and record company execs. Even Mick Jagger was there anxious to sign the band to his own Rolling Stone Records! They received several offers, but most weren't willing to accommodate Jerry's demands for the 2 Tone label to maintain it's own identity. One who did was Chrysalis Records, and the deal was done - 10 singles a year from 2 Tone, and the Specials were signed to a 5 album deal. Amazingly that show was recorded unbeknownst to those involved. Decca studios was next door and the entire concert was captured through an audio feed they had set up, which serves as a great reminder of the bands early form. The bootleg features plenty of Terry's dry humour on the eve of the Thatcher election, along with a killer live performance to boot. Ironically this bootleg made it onto the streets just days before their debut album was released. Chrysalis pressed more copies of 'Gangsters', and fuelled by a Radio One session on the John Peel show and an eight week tour of the UK, the single peaked at number 6 in the singles chart, earning a debut appearance on Top Of The Pops. Along the way, 2 Tone signed it's first band - The Selecter - which was a hastily put together band formed by Neol Davis on the back of the success of the Gangsters/Selecter single. The second 2 Tone signing was Madness, after they had got a tape to Jerry, and had opened for the Specials on a couple of occasions to great success.